Mayo 1-13 NUIG 1-11 (MacHale Park, 4/1/2015). MAYO: Robbie Hennelly; Darren McHugh (0-1), Ger Cafferkey, Stephen Coen; Chris Barrett (0-1), Caolan Crowe,Kevin Keane; Jason Gibbons, Alex Corduff; Neil Douglas (0-4), Adam Gallagher (0-1, free), Michael Conroy (0-1); Evan Regan (0-3, frees), Jason Doherty (0-1), Mark Ronaldson (1-1). Subs: Alan Freeman for Doherty (black card, HT), Keith Rogers for Cafferkey (HT), Mikey Sweeney for Conroy (HT), Barry Moran for Corduff (50 mins), Ger Cafferkey for Douglas (injured, 51 mins). Mayo 0-15 IT Sligo 0-6 (James Stephens Park, Ballina, 11/1/2015). MAYO: David Clarke; Kevin Keane, Donal Vaughan, Steven Duffy; Michael Hall, Keith Rogers, Patrick Durcan; Alex Corduff (0-1), Barry Moran; Kevin McLoughlin (0-3, one free), Morgan Lyons (0-1), Peter Dravins (0-1); Evan Regan (0-3), Alan Freeman (0-4, one free), Mikey Sweeney (0-1). Subs: Darren McHugh for Keane (HT), Chris Barrett for Durcan (44’), Jason Gibbons for Corduff (51’), Jason Doherty for Hall (51’), Mark Ronaldson (0-1) for Sweeney (53’). Mayo 1-10 Roscommon 2-12 (MacHale Park, 18/1/2015). 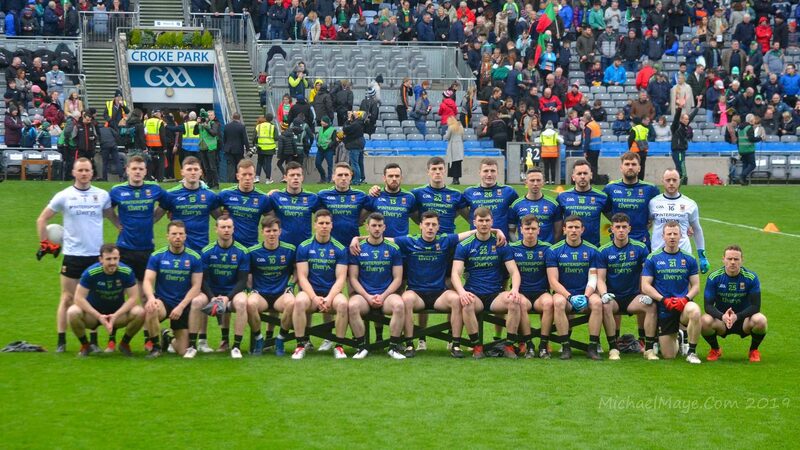 MAYO: Kenneth O’Malley; Chris Barrett, Donal Vaughan, Lee Keegan; Colm Boyle, Stephen Coen, David Drake; Seamus O’Shea, Barry Moran; Kevin McLoughlin (0-6, five frees), Morgan Lyons, Diarmuid O’Connor; Enda Varley, Jason Doherty (0-4, three frees), Darren Coen. Subs: Alan Freeman (1-0, penalty) for Lyons (35′), Keith Rogers for Drake (43′), Caolan Crowe for Darren Coen (45′), Mark Ronaldson for Boyle (46′), Jason Gibbons for Moran (48′). QUARTER-FINAL: Mayo 4-7 Leitrim 0-8 (MacHale Park, 11/3/2015) MAYO: Matthew Flanagan; Michael Hall, David Kenny, James Stretton; Sean Regan, Stephen Coen, Patrick Durcan; Diarmuid O’Connor, TJ Byrne; Val Roughneen, Adam Gallagher, Darren McHale; Cian Burke, Brian Reape, James Durcan. Subs: Conor Loftus for Reape, Matthew Ruane for Byrne, Michael Plunkett for McHale, Morgan Lyons for O’Connor, Kevin Lynch for Patrick Durcan, Steven Conroy for James Durcan. SEMI-FINAL: Mayo 0-11 Galway 1-12 (MacHale Park, 21/3/2015). MAYO: Matthew Flanagan; Michael Hall, David Kenny, James Stretton; Patrick Durcan, Stephen Coen (0-2), Sean Regan; Diarmuid O’Connor, Val Roughneen; Matthew Ruane, Adam Gallagher (0-2), Darren McHale (0-1); Kevin Lynch, Conor Loftus (0-1), James Durcan (0-4, frees). Subs: Michael Plunkett for McHale, Cian Burke for Lynch, TJ Byrne (0-1) for O’Connor (black card), Eoghan Lavin for Roughneen, Eddie Doran for Stretton, Brian Reape for Plunkett. SEMI-FINAL: Mayo 1-3 Galway 3-14 (MacHale Park, 4/7/2015). MAYO: Patrick O’Malley; Donovan Cosgrove, Tommie Keane, John Maughan; Paul Lambert, Rhyne Collins, Dylan Cannon; Barry Duffy, Jonathan Burke; Darren Quinn, James Lyons, Ross Egan; Liam Byrne (1-1), James Carr, Gerry Canavan (0-1). Subs: M Keady for Lyons, Jack Irwin for Duffy (inj. ), Cormac Reape for Lambert, Colm Moran for Quinn, Paul Walsh for O’Malley (black card), Kevin Quinn for Egan.